Fibreglass Leads Protected with Steel Overbraiding. These high pressure thermocouple plug sensors are ideal for vessel applications, pressurised containers and applications requiring mounted NPT security. The 304SS sheath has a 1/4" dia. that extends 1/2" from the end of the 1/4 or 1/8NPT pipe plug. Other length sheaths are available. The thermocouple-grade lead wires are stranded 20 AWG, fibreglass insulated, and stainless steel overbraided with stripped leads. Connectors are attached on request. Junctions are grounded or ungrounded for a pressure rating of up to 2500 psi. 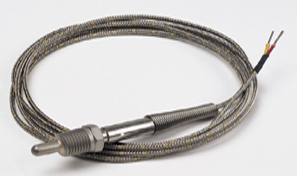 Exposed junctions are available for air or gas temperature measurements at ambient pressures. To tighten mounting threads, there is a hex section that is 22mm (.56") across flats that are 5.8mm (.23") wide.